It has been almost a year since the day I posted an article here called Everest 2012. I still remember typing it up, smiling nervously, happily and incredulously at the title. I’d climbed and trekked like a maniac and worked days and nights, earning the nickname ‘Red Bull Didi’, to pay the astronomical expedition invoice. Once I clicked ‘Publish’, my impossible dream to scale the world’s highest mountain became a daily struggle not to get crushed by the experience. In spite of coming close to dying on descent, a week after my return to Kathmandu, I wished for nothing more than a chance to be on Chomolungma again. Training for the climb and subsequently being on the mountain had made me a different person – a person I liked. If my newly-developed qualities were to survive, I had to continue challenging myself even more, if possible. There is no greater challenge on this planet that I can think of than climbing Everest without the use of supplemental oxygen, and so I return to The Mountain this spring. I wish to give Mother-Goddess of the World what I keenly feel I owe Her: my gratitude, but also my life, – for her to give back to me, ever more worth living, or to keep on her airless, icy slopes. According to this article (http://ngm.nationalgeographic.com/everest/blog/2012-05-18/to-os-or-not-to-os)from last year, over 3500 people have climbed Everest, 5% of them – without the use of supplemental oxygen. Another article (http://www.mounteverest.net/story/Everest2005WomenonTopMar232005.shtml) from 2005 says that ‘about 90 women have summited Everest so far, but only three of them did it without oxygen. They were New Zealander Lydia Bradey in 1988, British Alison Hargreaves in 1995, and American Francys Arsentiev in 1998. Sadly, Francys died on descent.’ I imagine, by now there must have been over 100 ascents of Chomolungma by female climbers, and definitely a third successful climb without O2 by Gerlinde Kaltenbrunner in 2010. Do I stand a chance? No. However, I can and will try my absolute best, as always. If there’s any life left in me after the attempt, whether failed or successful, I will return to Everest base camp, rest for a few days, and, weather and health permitting, climb back up – to Lhotse, the world’s fourth highest mountain at 8516 meters. Is there so much as a remote possibility of me pulling this off – any part of it, not to mention the whole undertaking? Hardly. This is a very unrealistic plan, with, perhaps, only a 5% chance of success, and even survival being… rather uncertain. These are not great odds, but they are good enough for me – an average person with dreams not fit for such. Cursed as I am with my unbridled imagination like Albert Camus’ Sisyphus is with his rock, I can’t help climbing and falling back, and climbing, and falling, over and over again. Drop by if you would like to follow my preparation for the climb, which will undoubtedly be by far the hardest I have ever attempted, or simply the last. Thanks, buddy 😉 ! Will need lots of it! You are very courageous Mila, and I know you wrote about courage after your ascent last year. I will be watching and giving me thoughts to you. I’m heading to Nepal at year end to do Loubouche East, Pokalde, and Island Peak, and if all goes well back in 2014 for Cho Oyu…you are providing great inspiration! Hi Baz! Awesome to see you here again! I am very excited for you! The three are all fun climbs and very good prep for 8000-ers. I like your serious approach to preparation for Everest, and wish you every success with your climbing! Good luck, good health and good weather to you up in the Himalaya! I’ll be drawing on your knowledge, thanks! Same as with any other challenging pursuit, I believe, it’s really hard to get anywhere in the mountains if one doesn’t enjoy the whole experience of mountaineering. The journey has to be an end in itself, and the summit – a bonus, as they say. 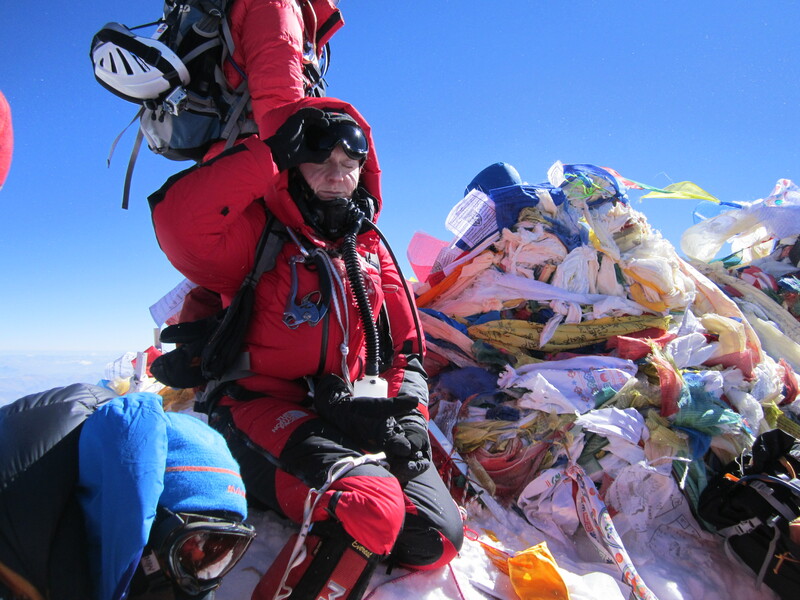 As for Chomolungma, just wait till you see Her from the summit of Cho Oyu… ;)! I was amazed by your first climb…the difficulties that you overcame…I once again will be vicariously by your side again as you climb Chomolungma…may be be kind and bless you. Oh, thank you! It means the world to me that a person I have never met outside of the Internet space should cheer for and support me as you do – in my writing and all other adventures! Nothing could possibly stop Red Bull Didi. I feel certain of that! Hahaha! The certain absence of Red Bull, lack of oxygen, frostbite, illness, exhaustion, overcrowding on the route etc could all stop Red Bull Didi. I can only hope for a miracle – that they won’t. Well, the fullness of your commitment and your spirit is inspirational! There’s a song in Russia that goes something like this: ‘If you’re going to fall in love, let it be with the queen; if you’re going to steal, make it a million; if you’re going to climb, go for Everest’. Although some people dread it, commitment to tough goals can actually make for an exciting life :)! It is your will Mila but please take the oxygen. I would think no O2 is hubris and disrespectful to the mountain and we must show that we accept our inferiority to the mountain. One may reach the summit but can never claim to have conquered the mountain for one reaches its summit not by strength alone but by the mountain’s grace. Absolutely, Carl! I felt it very keenly up there that it was Chomolungma, who decided, who was worthy of what fate. I respect the mountain very much indeed, which is why I am making her this offering – my strength and life, again – as a sign of trust and love for her. Climbing without oxygen, in my opinion, is the ultimate show of respect because, with or without O2, one’s inferiority to the forces of the mountain must be assumed. When one climbs without supplemental O2, that inferiority is also fully accepted and the full weight of the responsibility for one’s weakness must be carried. One plays by the mountain’s rules, without any tricks; if the mountain or their body say it is impossible, well, impossible it is. I will have O2 available for emergency use, don’t worry. If it feels ‘wrong’ to be climbing without it, I will use the gas. However, to attempt the climb without it is a dream for many a true mountaineer, and I owe it to myself and Chomolungma to place my dream and my everything, really, in her hands one more time. Mila, your courage is unending, and your wisdom will take you to the top, so to speak. Flattered you should think so! Thank you for reading!